Most of the time, monied interests manage to get their way without little opposition from Joe Q. Public, but it doesn’t always have to be that way. Instead of recreating the scenario and giving you snippets of the November City Council meeting, we think the entire letter read by Stephen Kendall from the Kenmore Neighborhood Association should be published as a “guide for other concerned citizens” who sometimes feel oppressed by large corporate interests and want to take action. Mr. Kendall and his neighborhood association took action when Indiana & Michigan Power decided to expand the power substation located at Tillotson and University Avenue without gathering sufficient community input. As a result of the organization efforts of Mr. Kendall and the Kenmore Neighborhood Association, an amendment was made to the Comprehensive Zoning Ordinance altering the substation expansion plans of Indiana Michigan Power. On behalf of the Kenmore Neighborhood Association, and I’m sure many others, I want to say thank you to Mayor Tyler, the Plan Commission, Marta Moody, and City Council, for standing up for good planning and a better vision for Muncie’s physical environment. 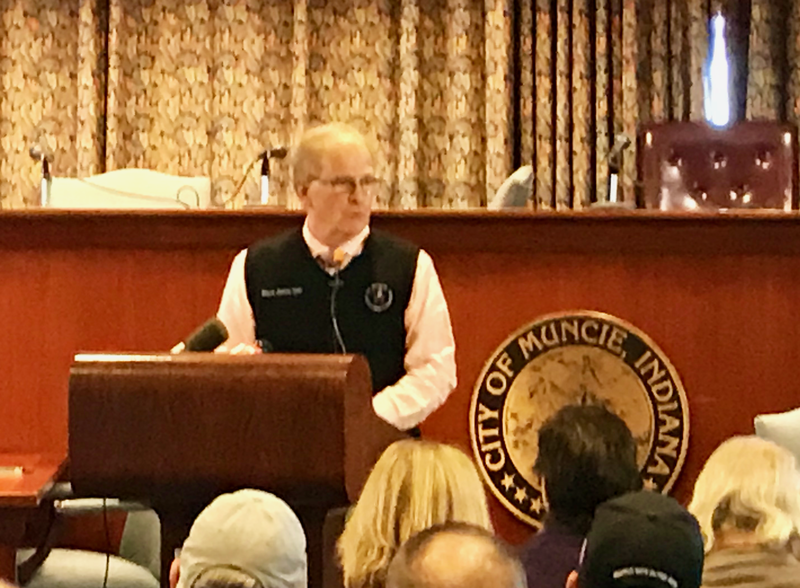 I believe that the amendment to the Comprehensive Zoning Ordinance that you will be voting on is an important step toward a more vigilant and optimistic vision for Muncie’s public environment. Our environment has been torn apart and corrupted over many years, and is under constant threat from ignorance, corporate malfeasance and a generally pessimistic and fatalistic set of public expectations. There has been a long legacy of less than stellar decisions at the public level and action by private interests with no vision larger than their own short-term bottom line. Other Indiana small cities, such as Columbus, stand as examples of what Muncie could have been, had private and public interests converged over time on a more enlightened vision of our common inheritance and future. It requires herculean efforts to recover from bad planning, bad policies and selfish motives, as we can see also on the national level. Muncie is not immune from these traumas, but if you approve this amendment, it will be a step in the right direction. From the beginning of the resistance we initiated to the oversized and misplaced replacement of the Tillotson substation, we – the Kenmore Neighborhood Association – have made every effort to elevate this issue beyond the NIMBY syndrome. We have reached out to the entire City of Muncie and beyond with an on-line petition that now has more than 700 signatures; to the Muncie Star Press; to Ball State University and IU Ball Memorial Hospital, State legislative representatives, the Citizens Action Coalition, the Indiana Utility Regulatory Commission, and the Indiana Office of Utility Consumer Counselor. We have reached out to IU Health’s President, an attorney who has litigated utility issues, various attorneys locally and at the state level, and have had research support from urban planning faculty and students at Ball State. Marta Moody and her staff have studied other zoning amendments as models, and Mayor Tyler has been doing his due diligence with his own substantial network. I believe it is correct to say that the resistance has become very substantial. If the proposed substation replacement were to be implemented, it would have significant and immediate negative effects on the value of properties adjacent and nearby. It would also begin to erode the edge of a solid and lovely residential neighborhood, which we have been and are diligently working to protect and enhance. It would also be a slap at both Ball State and IU-BMH, because both institutions have a stake in the quality of their immediate environments. These negative effects are to no one’s advantage, just as the thoughtless replacement of the Wysor Substation as implemented is to no one’s long term advantage – from a city and neighborhood planning perspective. Who – of any age, income level or status – wants to live next door to such an industrial-grade facility? The good people in the neighborhood of the South Utica station also didn’t deserve to have that replacement substation squeezed into the neighborhood, within 20 feet of a church and a neighboring house, which, by the way, is now vacant with boarded up windows, in no small measure, I’m sure, because no one would want to have the humming substation across the fence. Certainly none of the IMP executives and community relations’ representatives, or their friends or relatives would ever choose to live next to one of their facilities, and if such an ugly facility were planned for their neighborhoods they would fight hard to prevent it. Public utilities are just that – public. Even if the corporations operating them are private, with stockholders expecting increased stock value, the very nature of a public utility is to consider the public’s larger, long-term interests in an equitable way. These interests include – beyond the minimum expectation of safe and reliable delivery of the utility service – principles of good city planning, good urban design, and the value of private property, community and neighborhood life. 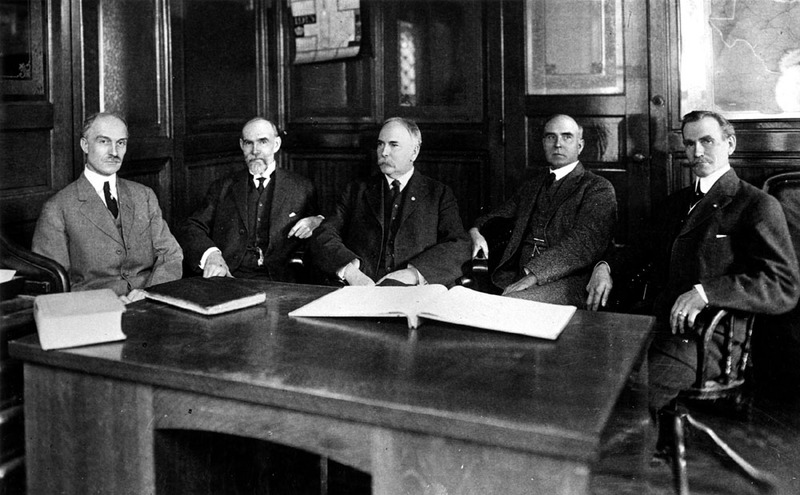 Small cities like Muncie, with small, underpaid and understaffed planning departments, and sometimes complacent and compliant elected officials, with citizens pressed by the necessities of daily living even in the best of times, are easy victims to the too-narrow vision of many public utilities, regulated by appointees who often have cozy relations with those they regulate. It’s convenient for a public utility to act unilaterally, as the Tillotson substation replacement proposal shows, because from their point of view, it’s efficient to work that way. IMP had no reason to expect resistance, because there had never been any preemptive opposition to a substation replacement before in Muncie. IMP’s engineers have known for at least a decade – and probably longer – that this substation would need to be replaced. They selected their optimum substation design “out of the drawer” (they have many “stock” plans) and decided to build it. Did they engage in a long-term planning process with the City? Did they consider alternatives until pressured to do so? Are we to take seriously the assertion that IMP is interested in “partnering” with Muncie, given the behavior over the past decades? I hope that City Council passes the proposed amendment unanimously, without changes, to show the determination of the City government to stand for good planning and neighborhood values. I also hope, when IMP comes to the Zoning Board of Appeals for a variance, that the standards set out in the amendment language will be fully upheld and not watered down by threats of various kinds. The idea that IMP could claim that terrorists would hide in the required trees, and that IMP could argue to the IURC that the residents of Muncie should pay higher rates for electrical power because IMP is now forced to adhere to sensible planning principles is preposterous. Had IMP engaged with the City years ago in long-range comprehensive planning for the siting of its infrastructure, none of this struggle would be needed, and IMP would not need to resort to threats to fulfill its responsibilities. “Optimism is a political act. Those who benefit from the status quo are perfectly happy for us to think nothing is going to get any better. In fact, these days, cynicism is obedience.” ~ Alex Steffen, The Bright Green City, a book about combining reduced environmental impact and improved design.